As per my prediction for the ODI series between India v Sri Lanka, the 1st ODI was won by India. This was a jackpot match for me in terms of profit. I couldn’t have dreamed of any better match at this Jackpot Sunday. I won in all of the sports betting. Including profits for 3 Cricket and plenty of Football matches. 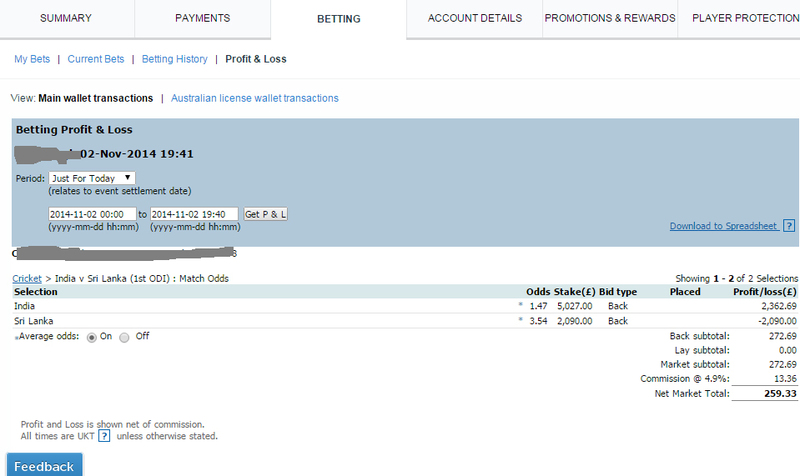 Following is the screenshot of winnings at Betfair. I made £259.33 in profit after Betfair commission. I placed bet in advance yesterday night and balanced it in advance using Tarazu. By the time I woke in the morning today at 10:00 AM I had already made the profit as India’s openers were still on the crease and total score was already well above 200. Everything went as planned and predicted. India batted first and scored massive runs. I exited trading just after India’s innings. This was a perfect Sunday to start and I made loads of more profit on all my sports betting (read trading). 1.15 is not a good odd to back any team. to get 15 you have to risk 100 and then add you have 2 more risks of Draw and Aus winning. Draw will go up if Australia builds up partnership. It can ho as high as 1.25 to 1.3 but I doubt it will go beyond that. Wickets will fall and Australia is more likely to lose. As I said earlier better leave this match now. It’s gone case. Please advise all of us in this forum how and when to implement stop loss , if market going against to our bets. Is it purely on personnel responsibility ?.